Hackett's total compensation during each of his last three years at Steelcase was $5.8 million. 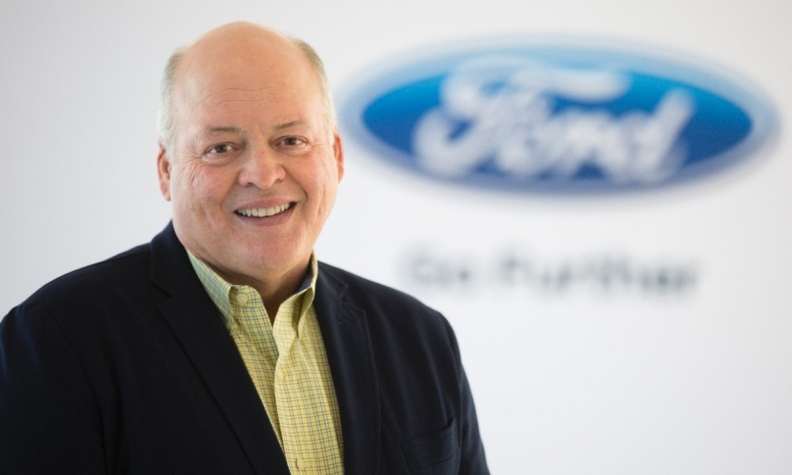 DETROIT -- New Ford Motor CEO Jim Hackett received a 151 percent raise in his base salary this week, rising to $1.8 million from the $716,000 he made as chairman of Ford Smart Mobility. In a Wednesday filing with the Securities and Exchange Commission, Ford said Hackett will also receive a $1 million bonus and stock awards of about $7 million. He could also receive a performance-based bonus of about $3.6 million if the company meets internal targets. His total compensation for this year is valued at up to $13.4 million. Hackett earned about $5.8 million in total compensation in each of his last three years at office furniture maker Steelcase, according to filings. Former CEO Mark Fields received a $1,787,500 base salary in 2016. His total compensation was $22.1 million. In addition to Hackett, Ford said Wednesday that Joe Hinrichs, recently appointed president of global operations, will receive a restricted stock grant valued at $5 million. Ford said Fields' resignation from the board is effective immediately, and his retirement will be effective Aug. 1. He will be eligible to earn bonuses and have "reasonable" use of the company's private aircraft through that date.